In these historical performance-aware times it’s now a comparatively rare event for a Baroque recording to throw up a genuine slice of musical-instrument exoticism. 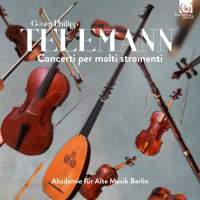 However, that’s precisely what the Akademie für Alte Musik Berlin have managed with this Telemann programme of multi-instrument concertos, thanks to the presence of the B minor Concerto, TWV53:h1, whose solo trio consists of two flutes and a…calchedon. Now in fact the calchedon is simply a specific type of large, six-course, long-necked lute also known as a galizona. Furthermore, calchedons or galizonas actually appear in over 400 of Telemann’s works, used primarily as a bass-line instrument. And indeed that’s how the one here appears, meaning that it’s not going to sound as exotic to your ears as it looks on paper. Still, its mere presence on this recording (lutenist Michael Friemuth playing a copy of an instrument made in Prague in either 1718 or 1728), and indeed the page of the booklet notes dedicated to explaining it, illustrates the sheer degree of joyful, historically aware, multi-timbral music-making going on across these eight works. It really is a varied feast too; among the other solo groupings are three horns and violin, two oboes and bass, three oboes and three violins, and perhaps the most delightfully timbred one of all, Concerto TWV53:F1 for mandolin, hammer dulcimer (strings stretched over a trapezoidal sounding board), harp and strings. Of course timbres alone do not a high-quality recording make. However, to all the above the Akademie für Alte Musik Berlin have added warm tonal brilliance and depth, bristling textures and a smartly nimble perkiness, and the result is a superbly colourful listen that ticks all possible boxes.